She celebrated her 100th birthday on Friday, February 20th, 2009.
âI feel good! By the mercy of God I have been kept here. I love my master,â said Nedd, the mother of eight children (six deceased), 25 grandchildren, 150 great-grand children, and eight great-great-grand children. 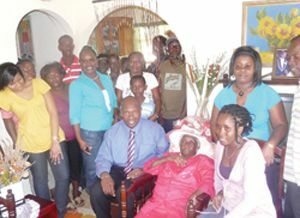 Besides having several relatives and friends at her home in Diamond to celebrate the milestone with her, Nedd also received a visit from His Excellency the Governor General, Sir Frederick Ballantyne. The devout member of the New Testament Church of God, sharing the secrets of her longevity, said one has to be in love with God and thank him for every minute, as well as every hour. Prior to joining this church, she was originally a Spiritual Baptist. Nedd, who was born 70 years after the abolition of slavery in the Caribbean, plied her trade as a labourer on both sugar and arrowroot plantations. She also sold chives and other agricultural produce in the communities between Diamond and Fancy. Her loved ones were also quick to point out that she walked all the way from Diamond to sell her produce in the other communities and this might have been responsible for her longevity. In an interview with SEARCHLIGHT, Senator Caesar said Nedd assisted in raising his father and also played a great influence on his life (Sabotoâs). âShe inculcated hardwork, dedication, and discipline in me,â said Caesar. He said though he is quite close to his great-grandmother he is planning to be closer than before. Caesar said Neddâs feat speaks well for longevity in his family.